Each year the Northern Alberta Institute of Technology (NAIT) invites a renowned chef to their culinary arts program to take the role as Hokanson Chef in Residence. 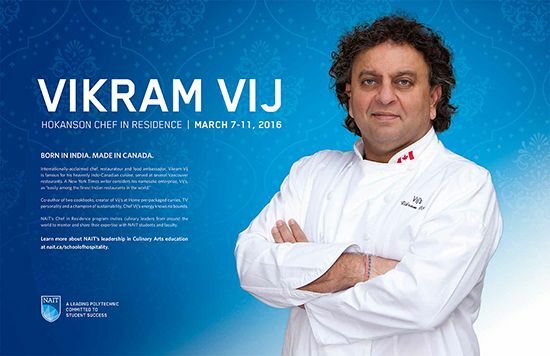 Last week NAIT announced that Vikram Vij will be taking the role this coming March 7-11. As a wrap up to the program each year, NAIT hosts a luncheon where the guest chef prepares a three course meal with the culinary arts students. The lunch prepared last year with Chef Michael Statdlander was incredible and I can’t wait to see what Chef Vij has up his sleeves. 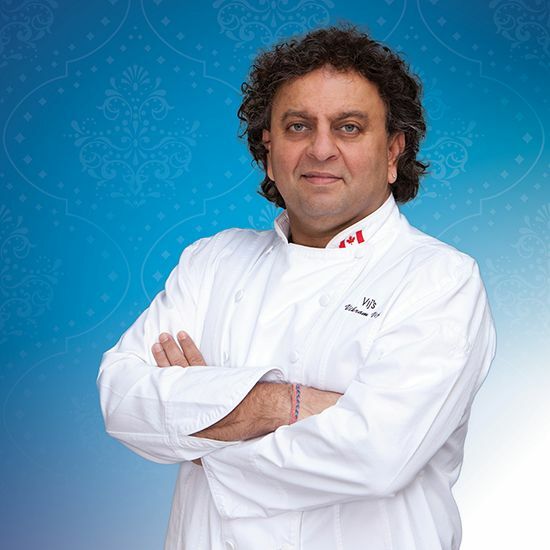 From watching him on Top Chef and Chopped, to trying some of his signature dishes, I’ve always been a huge fan of Chef Vikram Vij and I am so excited for his visit to Edmonton. This year the exclusive lunch is taking place on March 10th at Ernest’s Dining Room, and I want you to be there too. NAIT has offered me the opportunity to take one reader as my guest for the luncheon, so I hope you can join me from 11:30-1:00 PM on the 10th! Simply follow the giveaway instructions at the end of this post. If you don't want to take your chances, a limited quantity of tickets for the luncheon will be on sale at 9:00AM on February 22nd via Ernest's for $85 each. Tickets sell out fairly quick, so get up early to grab your seat. NAIT is also giving away four pairs of tickets and you can enter here. Hope to see you there! To Enter: Tell me who you would like to see as the 2017 Hokanson Chef in Residence in a comment below. This giveaway is open to anyone 18+ years of age in Edmonton. You have until March 6th to enter and the winner will be selected by random and be contacted via email. Good luck! Day by day Edmonton's downtown skyline is changing, and so are the businesses in the area. 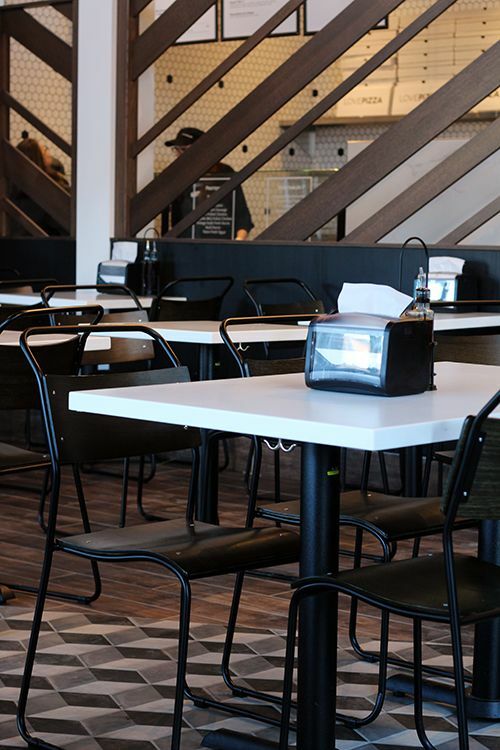 At the end of January, Love Pizza opened its doors in the Canterra Shopping Centre off Jasper Ave & 109 Street. To me, pizza is a food that brings people together. 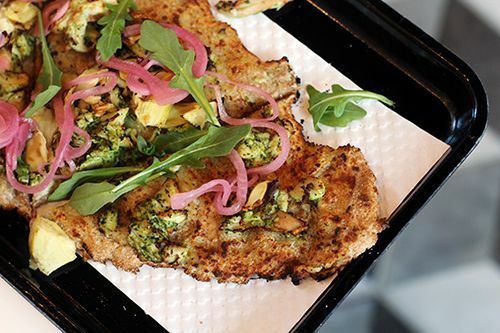 Pizza is a staple at parties, and you typically share pizzas with others. But the story behind Love Pizza is a little bit different - co-owners Braede & Gavin shared pizza on their first date and fell in love over pizza. 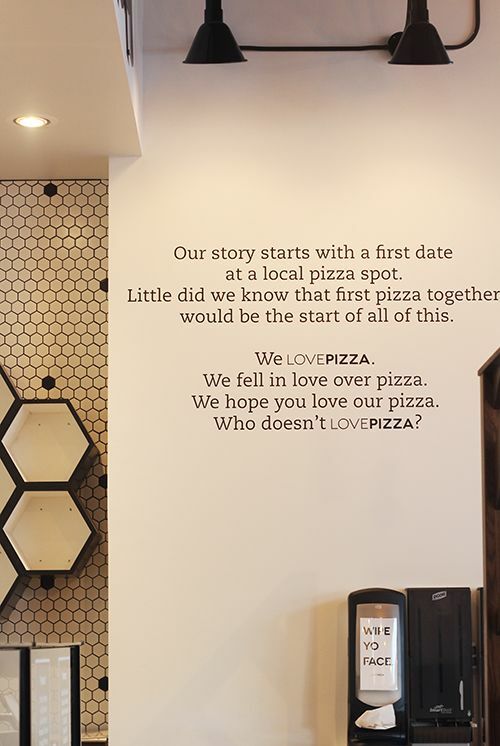 Love pizza is the baby of their love story, and I think it's great that their story is up on the wall for all to see. I met up with some girlfriends for lunch last Tuesday and the space was packed with hungry patrons. Aside from the amazing smell of freshly baked pizza, I was immediately drawn to the clean, minimalist design of the space. The use of black and white with geometric shapes give the space a trendy, modern feel. Like many fast-casual restaurants, Love Pizza runs on a self serve concept where you place your order up at the counter. Pizza dough is made in-house daily, and you have the choice between a Traditional Caputo '00', 100% Whole Wheat made with Gold Forest Grains flour, or Gluten Free crust (+$3). After choosing your base, you can choose from one of the 11 signature pizzas ($11.95) or go on an adventure and build your own for the same price. 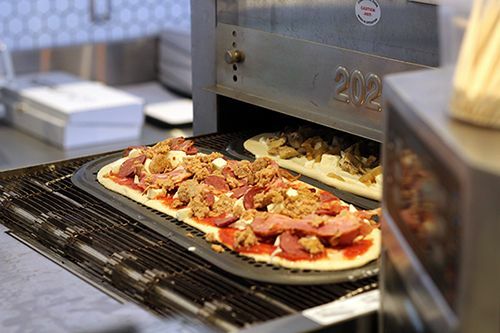 The signature pizzas feature some mouthwatering combinations, but with housemade sauces and specialty toppings like artichoke hearts, capicolla, and pecorino, you could make a pretty fantastic pizza. Whichever route you choose to take, the pizza goes into the oven for 3 minutes and your pizza is hot and ready. I'm a huge fan of mushrooms on pizza, so I was immediately drawn to the Holy Shiitake ($11.95) on the traditional crust. 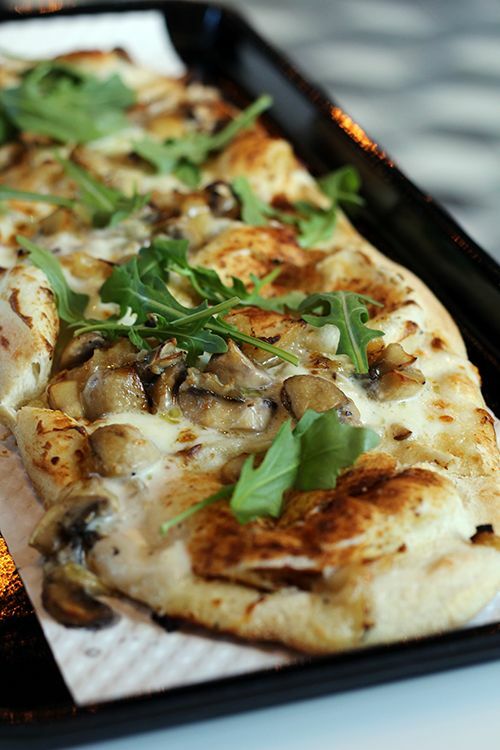 This vegetarian pizza features housemade truffle parmesan sauce, Fior Di Latte, a roasted mushroom blend, caramelized onions, and fresh arugula. My pizza had an abundance of toppings, but I was only able to make out two different mushrooms. I had hoped for a greater variety, but perhaps the blend hadn't been well mixed. While the combination of toppings was delicious, there wasn't the hit of truffle flavour I was expecting to come from the sauce. Finishing the pizza with a drizzle of truffle oil would have made this pizza perfect for me. On to the base. If there's two things I hate in a pizza crust, it's when crust enters flatbread territory, and when crusts are soggy and unable to hold up the weight of the ingredients. The '00' crust at Love Pizza is anything but that - it's fantastic. 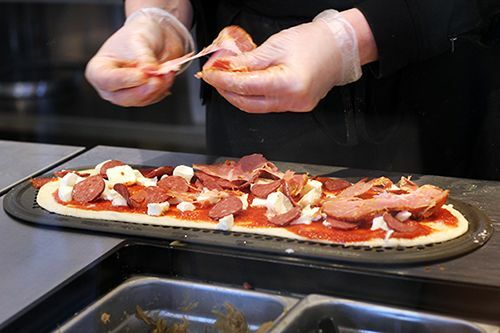 The dough rises enough to give the pizza structure and a soft bite, and it stays thin so as not to overwhelm each bite of pizza. Next came the Ode to Ukraine ($11.95), featuring a combination of roasted garlic spread, orange cheddar, shaved potato, Irving's Farm bacon, caramelized onions, green onions, and finished with a drizzle of creme fraiche. 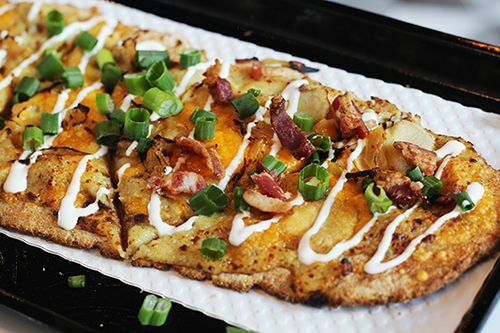 The flavour was similar to that of a perogy, and I enjoyed the added smokiness from the bacon. We opted for the whole wheat crust for this pizza and I found that it didn't rise as nicely or have the soft, chewy bite to it, making it similar to a flatbread. Although whole wheat is a healthy alternative, I'm definitely sticking to the traditional crust. For our final pizza we went with the City Market ($11.95) on whole wheat. Pesto pulled chicken, artichoke hearts, cherry tomato, pickled red onion and goat cheese rested on a bed of roasted garlic spread. It was another great combination of flavours, albeit a tad dry given the use of goat cheese. It's great to have another fast-casual restaurant open up in the downtown core, and I'm sure those working in the area would agree. Being a small business, Love Pizza aims to source local ingredients where possible to strengthen the community. One of the menu boards is dedicated to listing the local suppliers they partner with, and I think it's great that they make sustainability a priority. With a great selection of quality ingredients (there's over 40+ choices), the pizza combinations are endless, and I'll definitely be back for more. What's even better is that Love Pizza has a loyalty program where you can earn points towards free pizza, and you get free birthday pizza! Sign up here to get $5 off your first pizza and thank me later. 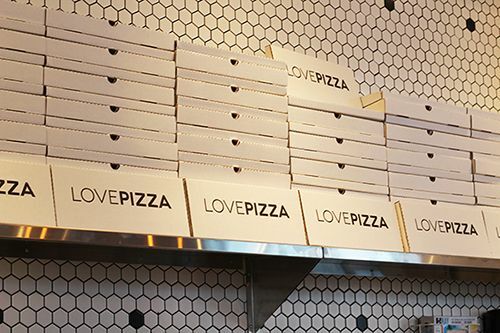 Whether you're grabbing lunch on the go, needing a late night bite, or going on a first date, give Love Pizza a try and see if you love their pizza too. If you're like me and you frequently drive down 124 Street you've probably noticed the signage for a new Japanese restaurant opening up on the corner of 124th & 107 Avenue. 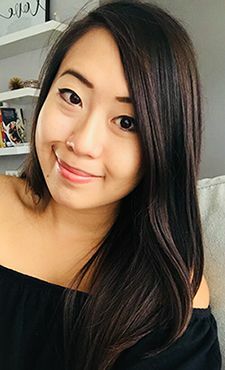 Japanese is one of my go-to cuisines when I'm dining out, so you bet I stopped by for lunch last week! Walking into Washoku I didn't realize just how big of a space the restaurant occupied. Semi-private rooms line the side of the restaurant, there's a space for a larger group, and multiple smaller tables occupy the main seating area. The lunch menu features a variety of bento boxes, maki, teriyaki, and Korean favourites like bulgogi and bibimbap. 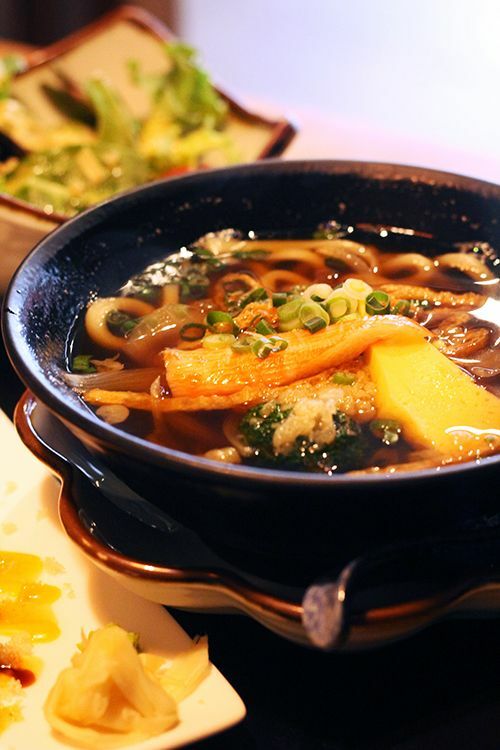 After placing our order, we each received a complimentary bowl of hot miso soup with tofu bits and wakame seaweed. 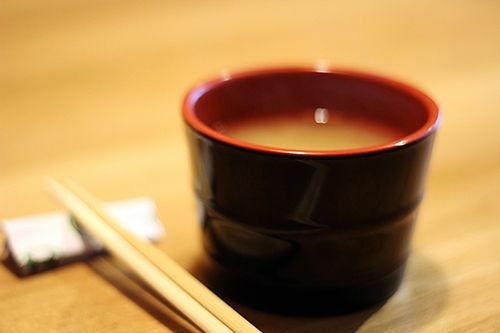 While it isn't expected, I always appreciate when Japanese restaurants give you a hot bowl of soup to enjoy while waiting for the rest of your meal! Green tea is a must for my boyfriend when we're out for Japanese. 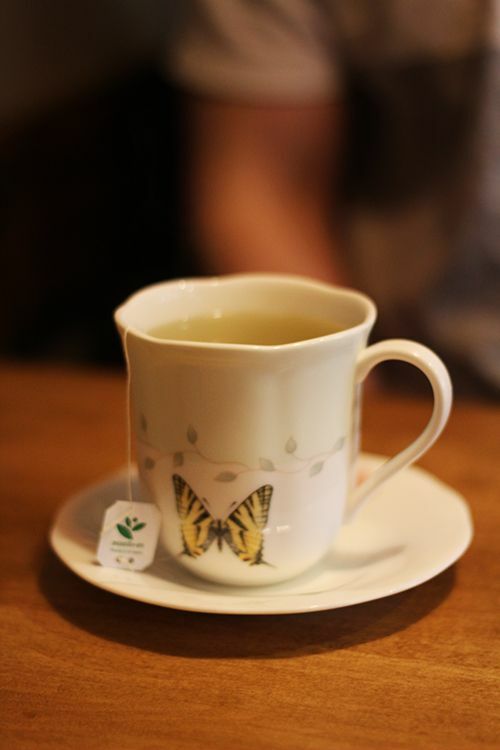 Restaurants typically bring a pot of green tea to the table, but we found it amusing when he was served a green tea bag in a dainty cup. It was the most peculiar thing and something we are always going to remember about Washoku. 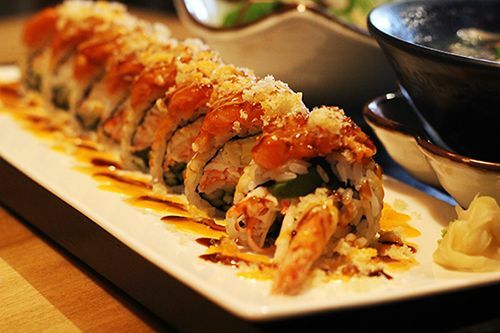 Half of the lunch menu is dedicated to 7 different sushi rolls. The rolls themselves are priced between $10.90-$13.90, but if you add $3 you can upgrade to a Lunch Roll Combo, which gives you a side salad and lunch sized classic udon noodle soup to go with your maki. It's a pretty good deal if you ask me! You would think that a 'lunch sized' udon noodle soup would be fairly a plain, small portion, but it's quite the contrary. The piping hot bowl of noodle soup is decently sized, and garnished with tamago (egg omelet), imitation crab, bean curd, green onion, and bits of tempura in the mix. The flavourful soup leaned on the slightly sweeter side, and the noodles had a perfect chewiness to them. In each combo the roll is divided into 8 pieces, and I was honestly surprised to see how big the pieces were! You definitely get a great value out of the lunch roll combo. 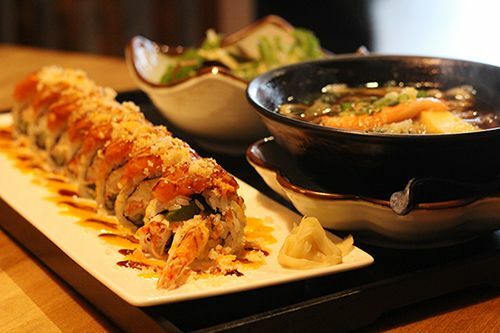 To go with my soup and salad, I chose the Crispy Crunch roll made with tempura shrimp, imitation crab meat, cucumber, avocado, spicy salmon, and tempura bits. The roll was presented on a mixture of nitsume (eel sauce) and sriracha mayo, giving the roll an extra punch of flavour. I enjoyed the extra spicy kick from the salmon and it paired well with the rest of the ingredients. From the sushi bar my boyfriend ordered the Sashimi & Roll Bento ($15.90) which comes with the chef's choice of 7 pieces of sashimi, 4 pieces each of spicy salmon roll and california roll, 3 pieces of tempura, and a side salad. Just like the lunch roll combo it was a substantial portion of food for a great price. 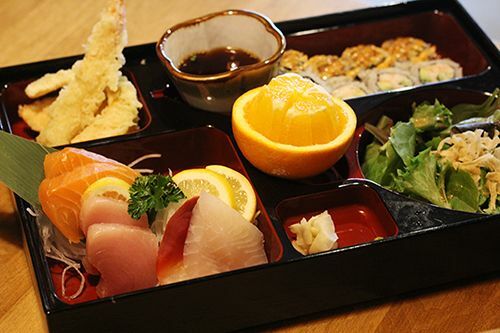 The sashimi in the bento was a mix of salmon, tuna, tilapia and surf clam, with each piece being thickly sliced. The salmon had a nice fatty texture, and all the sashimi was very fresh. The mixed salad and sushi rolls were fairly standard, with the spicy salmon being our favorite of the two rolls due it's kick of heat. The tempura batter was light, and each piece wasn't too oily - Gordon even decided it was the best tempura he's ever had. There's only one other option for Japanese food along 124 Street, so Washoku Bistro is a welcome addition to this area of the city. 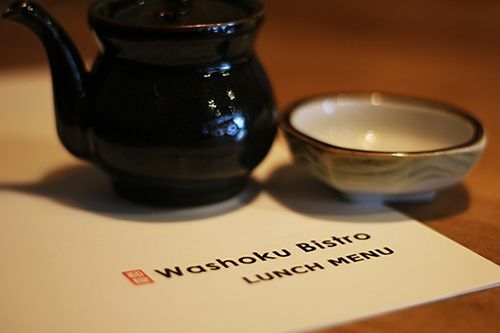 The service was attentive and the food arrived quickly to our table, making Washoku a great option for a quick, filling lunch. Food quality was great, and as an added bonus you get good value out of your meal for the price. 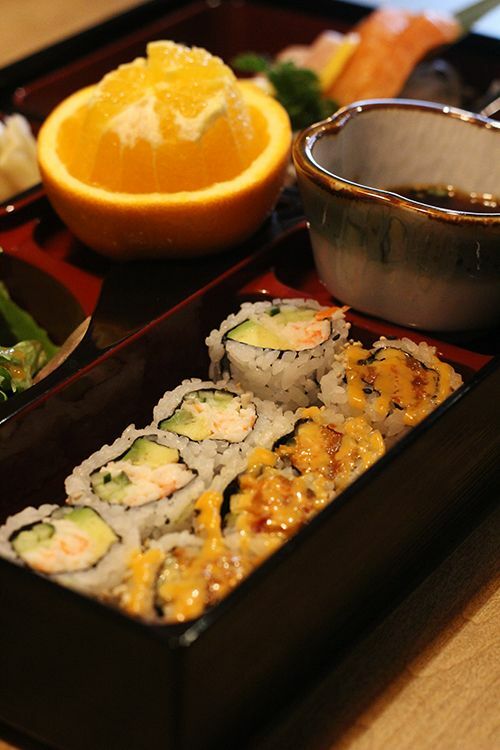 If you're looking for a new downtown lunch option, give Washoku a shot!